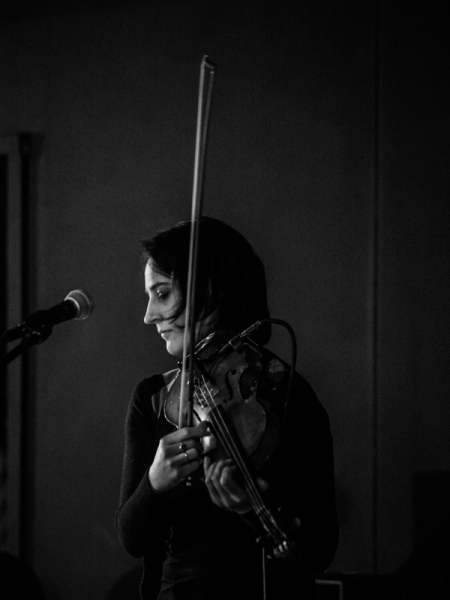 Sarah Bernstein is a violinist, composer, improviser, vocalist and poet based in NYC. Nominated “Rising Star” in the 63rd Annual DownBeat critics poll, she is a recognized innovator and in-demand violinist with many recordings to her credit. Her jazz quartet release Still/Free is out on Leo Records with Kris Davis, Stuart Popejoy and Ches Smith. She also leads the minimalist/experimental duo Unearthish with Satoshi Takeishi, improvising strings Frikativ Quartet and solo performance Exolinger. She co-leads the noise/poetry trio Iron Dog and synth-pop band Day So Far. Recent performances and recordings are with Kid Millions, Anthony Braxton, Steve Swell, Hans Tammen, Ron Anderson, James Ilgenfritz, Hank Roberts, Emilie Lesbros, Dave Scott, Andrew Drury, Taylor Ho Bynum, Christian Weber, Marco Kappeli, Ron Stabinsky and Tomas Fujiwara. Sarah is originally from San Francisco, CA. She holds a B.F.A. in Violin Performance from CalArts and an M.A. in Jazz Studies from CUNY Queens College.